One of the first important official acts of new U.S. President George W. Bush will be to submit to Congress a budget request for the entire U.S. Government for fiscal year 2002. For Americans with a stake in shipbuilding, a key budgetary concern is the amount of funding that will be requested for the Federal Ship Financing Program administered by the Maritime Administration ("MarAd"). The Program is commonly known as the "Title XI Program" because its statutory authority is spelled out under Title XI of the Merchant Marine Act, 1936. Well over $5 billion in these loan guarantees have been provided since 1993 by MarAd for a wide range of construction projects, ranging from large cruise ships and double-hulled tankers to fast ferries and a variety of cargo vessels. Further, the six U.S. shipyards that take the lead in ship construction for the U.S. Department of Defense point to the Title XI Program as important to the maintenance of the American national security industrial base. In addition, MarAd's conscientious effort to ensure that only the most meritorious projects receive funding has led to minimal defaults and a net gain to the U.S. Treasury of over $150 million from fees and interest since FY 1993. Until the last few years, the Program's funding levels have been close to the $50 million per year average contemplated in 1993 when the National Shipbuilding Initiative was enacted. However, budgetary pressures related in part to the cost of the 2000 census led to a precipitous drop in appropriations for Title XI for FY 1999 and FY 2000. Together with further underfunding in the FY 2001 appropriations Act, these meager appropriations have resulted in a $108 million shortfall. The $40 million available at the beginning of FY 2001 is historically the lowest amount of available funding since 1993, only enough to cover about $800 million in new project loans, with almost $5 billion worth of applications for new loans pending. To make up for three years of drastic underfunding and to ensure that funding will be sufficient to finance the projects likely to be approved by October 1 of this year, some shipbuilding advocates are pressing for $60 million in supplemental appropriations. They argue that this should be followed by at least $75 million for FY 2002 to further close the shortfall and to maintain the Title XI Program at the $50 million per year annual appropriation level. Background Prior to the implementation of the Federal Credit Reform Act ("FCRA") in the early 1990s, appropriations were not required for the issuance of a federal loan guarantee. However, thanks to the passage of the FCRA, the risk of default for every loan to be guaranteed by the U.S. Government must now be covered by appropriated dollars. Therefore, funds have been appropriated annually to provide risk reserves for Title XI loan guarantees from fiscal year 1993 to the present. In recognition of the long-term nature of shipbuilding projects, appropriations Acts do not require Title XI appropriations to be spent in a particular fiscal year but permit them to be carried forward from year to year until spent (so- called "no-year money"). Before a Title XI loan guarantee may be issued, MarAd evaluates the loan's default risk under guidelines from the Office of Management and Budget and in light of a number of statutorily prescribed risk factors. This evaluation results in a determination of the amount of risk reserve required. For budgetary projection purposes, the most common risk reserve for Title XI guarantees is five percent of the amount of the guarantee. Depending on the economic evaluation, the reserve may range from 1.5 percent to 15 percent. However, the risk reserve of most approved projects is close to five percent. When the new Title XI Program was authorized in the early 1990s, Congress committed to an annual funding level of S50 million. Yet over the past three years, the funding for the Program fell approximately $108 million short of the level that would have resulted from implementing the $50 million annual commitment. For example, the annual appropriation was only $6 million for FY 1999 and again for FY 2000. This underfunding was exacerbated last sum- Enhanced Safety and Operating Efficiency IBS is a comprehensive bridge system developed by JRC with three aims: energy conservation, reduced labor demands, and greater safety. A host of unique electronics technologies in fields ranging from radar, ECD1S and navigation data display to IRCS and INMARSAT — contribute to enhanced safety at sea with significantly lighter demands on the steersman. O S J D - 1 2 0 6 IRCS Workstation With this one workstation it is possible to operate a multitude of radio communication facilities. A user-friendly design ensures easy operation by all operators. J M A - 9 8 0 0 Color ARPA Radar This futuristically designed radar unit features a large 29-inch high-definition color CRT display. It enables quick detection of small targets. JAIN-3598 ECDIS Total Navigator This advanced ECDIS system permits fully automatic navigation. It features a large color LCD and abundant functions unique to JRC, including radar video overlay, grounding prevention, NAVTEX data, route safety check, alarm displays and engine data display. The result is greater safety and economy. INTEGRATED BRIDGE SYSTEM JRC] flapon R a d i o C o . , l i d .
ECDIS IS09001, ISOl4001 Certified Since 1915 Main Office: Akasaka Twin Tower, 17-22, Akasaka 2-chome, Minato-ku, Tokyo 107-8432, Japan Telephone:81-3-3584-8788 Telefax: 81-3-3584-8795 http://www.jrc.co.jp/ 12 JRC (OK) Ltd.: 136,1st Floor, Friars House, 157/168 Blackfriars Road, London SE18EZ, OK Telephone: 44-20-7261-1188 Telefax: 44-20-7803-0996 Seattle Branch Office: 1011 SW Klickitat Way Bldg. B, Suite 100 Seattle, WA 98134, 0SA Telephone: 1-206-654-5644 Telefax: 1-206-654-7030 New York Sales Office: Suite 208, 2125 Center Avenue, Fort Lee, NJ 07024, 0SA Telephone: 1-201-242-1882 Telefax: 1-201-242-1885 JRC do Brasil Empreendimentos Electronicos Ltda. Av. Almirante Barroso, 63-S/309, CEP20031-003 Rio de Janeiro, RJ, Brasil Telephone: 55-21-220-8121 Telefax: 55-21-240-6324 Circle 240 on Reader Service Card www.maritimetoday.com mer by the rapid draw down in the balance carried over from year to year, at a rate faster than anticipated in the Congressional estimates used to determine the annual amount needed in FY 2001. Title XI Guarantees Benefit the Defense Industrial Base The United States defense industrial base for naval ship production has diminished to six shipyards. These yards and the many smaller facilities that act as suppliers and subcontractors for major ship construction projects by the U.S. Department of Defense rely on commercial shipbuilding to maintain their skilled workforce during fluctuations in naval construction. Historically, markets for commercial and U.S. Navy shipbuilding have been cyclical, and both types of construction have thus been needed to sustain the core defense shipbuilding industry. The six national defense shipyards, for example, have delivered almost 1,000 large oceangoing commercial ships and 1,150 naval ships. The Title XI Program has been a key element in revitalizing commercial shipbuilding in the United States. This point was emphasized in a May 2000 statement by the late Rep. Herbert Bateman (R-Va.), then Chairman of the House Armed Services Committee's Merchant Marine Panel: "Commercial ships will not be built in the United States without access to affordable financing. The Title XI ship loan guarantee program makes that financing available and saves the taxpayer hundreds of millions of dollars in the cost of naval ships while sustaining a skilled workforce essential to building the warships that keep America free and prosperous. This program provides an enormous return to the American taxpayer." National defense shipyards are multibillion dollar enterprises, and commercial construction allows these yards to spread their large overhead over more ships, thereby reducing the cost to the taxpayer for naval vessels. Commercial work also facilitates the ability of these shipbuilders to introduce commercial building processes and technologies into naval shipbuilding, thus further reducing the U.S. Navy's ship prices. For instance, some commercial off-the-shelf systems work better and cost less than military-specified systems. Likewise the introduction of commercial manufacturing processes has resulted in fewer man-hours for naval ship construction. Over the last five fiscal years, the average annual obligation of funding for Title XI projects exceeded $50 million. These guarantees helped finance more than $4.8 billion in shipbuilding projects. There is about $40 million available for Title XI loan guarantees during FY 2001. Assuming an average risk reserve of 5 percent, these funds will provide financing for about $800 million in shipbuilding guarantees. 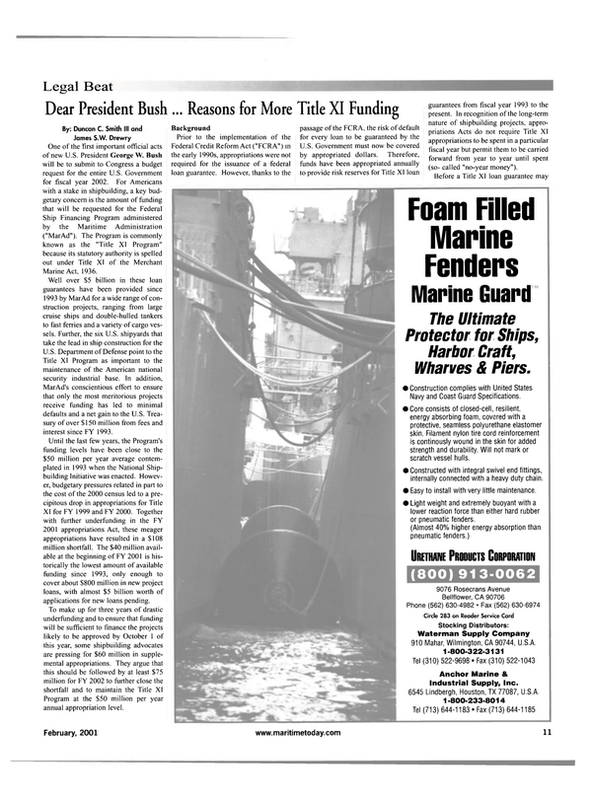 In contrast, applications for guarantees totaling nearly $5 billion await MarAd approval. The existing funds will be adequate to guarantee only 17 percent of the currently pending projects. While all of these projects will not be approved in FY 2001. Title XI funds may be fully expended by May 2001 if MarAd approves all the projects expected to be approved in the next several months. In addition, several of the largest projects awaiting action require more than the existing $40 million. Title XI guarantees provide financing every year for a steady stream of small and medium-size projects and periodically for very large shipbuilding projects. Major shipbuilding projects, which provide supplemental commercial work to national defense shipyards, are a central objective of both the National Shipbuilding Initiative and the Title XI Program, and require from two to four years to put together. Investors in these larger projects will not proceed unless they can depend on the necessary funds being available once they raise the millions of dollars in equity required before MarAd will consider a loan guarantee application. During FY 1994-1999 the available level of funding averaged $110.2 million annually, ranging from a low of $94.3 million to a high of $126.8 million. With this level of funds available, an investor interested in a very large project can be confident that Title XI funds will be in the account when needed for the project, even if $35-40 million every year goes to smaller projects. Dyer Ellis & Joseph, P.C. is a Washington, DC-based law firm with a domestic and international practice involving transportation, shipping, finance, corporate, securities, legislative, environmental, and trade matters.